DEER VALLEY RESORT; PARK CITY, UTAH (June 5, 2018) – Deer Valley Resort has unveiled its largest investment in capital improvements in over a decade with $8.1 million in mountain enhancements for the 2018-2019 season. Most notably, Deer Valley will replace the Homestake chairlift with a new, detachable, high-speed quad chairlift. The new chairlift will benefit skiers by cutting ride-time in half and increasing uphill skier capacity by 400 skiers per hour. The Homestake chairlift provides skier access from the Silver Lake Village to the top of Bald Eagle Mountain. Deer Valley will continue to add to its network of downhill mountain bike trails by building its fourth trail in as many years. Construction on an intermediate flow trail will begin this spring and the trail will feature an 8% grade across three to four miles on Bald Eagle Mountain. It will provide access to more trails by connecting the mid-mountain area to the lower-mountain base area and increase Deer Valley’s summer trail system to over 70 miles across four mountains. 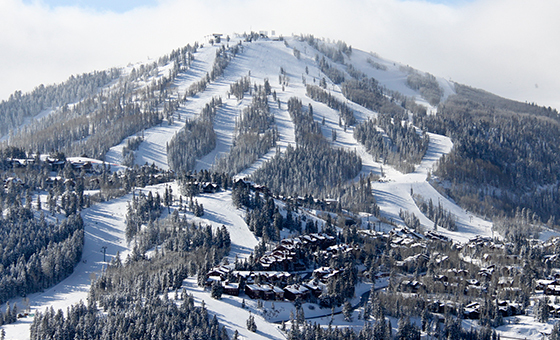 Deer Valley Resort's $8.1 million in capital improvements is part of $130 million dedicated by Alterra Mountain Company for enhancements at its 12 mountain destinations for the 2018-2019 season. In keeping with Alterra Mountain Company’s tenet to empower its leaders to be decisive, creative, and bold, destination presidents proposed their improvement priorities for the next five years. Plans for each destination were based on current needs and input from guests that will enhance the on-site experiences, while retaining each mountain’s authentic character. As part of Alterra Mountain Company’s commitment to growth and investment in its family of destinations, an overall $555 million is budgeted for improvements over the next five years and will be invested broadly to elevate the guest experience and introduce innovation and technology through new chairlifts and gondolas, snowmaking, food and beverage offerings, base areas development and access, and new adventurous summer experiences. New for the upcoming winter season, purchase your full price Deer Valley Resort 2018-2019 season pass by December 15, 2018 and receive a complimentary Ikon Base Pass. The Ikon Pass is North America’s newest season pass product for winter 2018-2019, offering over 63,000 skiable acres of unique terrain at 26 premier mountain destinations. With 26 destinations, in nine states and four Canadian provinces, the Ikon Pass is the gateway to a like-minded community, enduring memories, and the most iconic destinations in North America. For more information on the Ikon Bass Pass benefit for Deer Valley season pass holders or how to redeem your complimentary Ikon Base Pass, please visit seasonpass.deervalley.com. This benefit is only available for Full Deer Valley Season Pass purchases including Adult One, Adult Two, Teen, Child, Senior, Super Senior, College Student and Military. Deer Valley Tot and Midweek passes are not eligible for the program. For Deer Valley media inquiries, please contact the resort’s Senior Communications Manager, Emily Summers, at 800-424-DEER (3337) or 435-645-6522. For Alterra Mountain Company and Ikon Pass inquiries, please contact Kristin Rust at krust@alterramtnco.com or 303-801-7271. Alterra Mountain Company is a family of 12 iconic year-round destinations, including the world’s largest heli-ski operation, offering the Ikon Pass, the new standard in season passes. The company owns and operates a range of recreation, hospitality, real-estate development, food and beverage and retail businesses. Headquartered in Denver, Colorado with destinations across the continent, we are rooted in the spirit of the mountains and united by a passion for outdoor adventure. Alterra Mountain Company’s family of diverse playgrounds spans five U.S. states and three Canadian provinces: Steamboat and Winter Park Resort in Colorado; Squaw Valley Alpine Meadows, Mammoth Mountain, June Mountain and Big Bear Mountain Resort in California; Stratton in Vermont; Snowshoe in West Virginia; Tremblant in Quebec, Blue Mountain in Ontario; Deer Valley in Utah; and CMH Heli-Skiing & Summer Adventures in British Columbia. We honor each destination’s unique character and authenticity and celebrate the legendary adventures and enduring memories they bring to everyone. Alterra Mountain Company also owns Honua Kai Resort and Spa in Hawaii. For more information visit alterramtnco.com. This message is intended for mwinkle@deervalley.com.